The second issue of International and Comparative Law Quarterly for 2013 includes three articles exploring private international law issues and a case commentary of the VALE Építési Kft decision of the European Court of Justice. 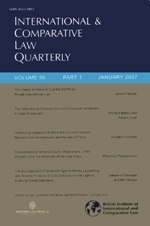 This article examines UNCITRAL’s draft Rules for Online Dispute Resolution (ODR) and argues that in low-value e-commerce cross-border transactions, the most effective consumer protection policy cannot be based on national laws and domestic courts, but on effective and monitored ODR processes with swift out-of-court enforceable decisions. The draft Rules propose a tiered procedure that culminates in arbitration. Yet, this procedure neither ensures out-of-court enforcement, nor does it guarantee compliance with EU consumer mandatory law. Accordingly, this article argues that the draft Rules may be inconsistent with the European approach to consumer protection. This article investigates what effects a recognized foreign judgment in civil and commercial matters has in English proceedings. Does the judgment have the effects that it has in the foreign country (extension of effects) or the effects that a comparable English judgment would have (equalization of effects), or a combination of these? After a review of the current law, it will be discussed what approach is preferable on principle. The suggested approach will then be illustrated by considering whether a foreign decision on one legal basis of a certain claim ought to preclude English proceedings involving another legal basis of the same claim. Finally, it will be discussed whether and how the effects of a recognized foreign judgment in England are affected by interests of a third country. This article analyses the relationship of the proposed Common European Sales Law (CESL) and the rules on mandatory and overriding provisions in private international law. The author argues that the CESL will not achieve its stated aim of taking precedence over these provisions of national law and therefore not lead to an increase in cross-border trade. It is pointed out how slight changes in drafting can overcome the collision with mandatory provisions. The clash with overriding mandatory provisions, the author argues, should be taken as an opportunity to rethink the definition of these provisions.